This is not a sponsored post. Box is bought with my own money. In a world which is obsessed with good looks and makeup, often no-makeup lovers are looked upon with amazement or curiosity. No, they aren't to be blamed, rather no one is to be blamed other than pre conceived notions. A great makeup canvas is made up of a great skin, which is often the result of a good or one can say excellent skincare regime. With the emerging skincare awareness, organic skincare products one is spoilt for choices. One, affordable and convenient way of saving big bucks on skincare and makeup products is subscription of a beauty box. Again, very few beauty boxes in India focus on just skincare. Today's post is about an innovative, inspiring and ingenious beauty box which allows you to use the raw ingredients as per your preferred DIY. Interesting na! The beauty box is Blend It Raw Beauty Box and am unboxing the February edition which is focused on skincare. 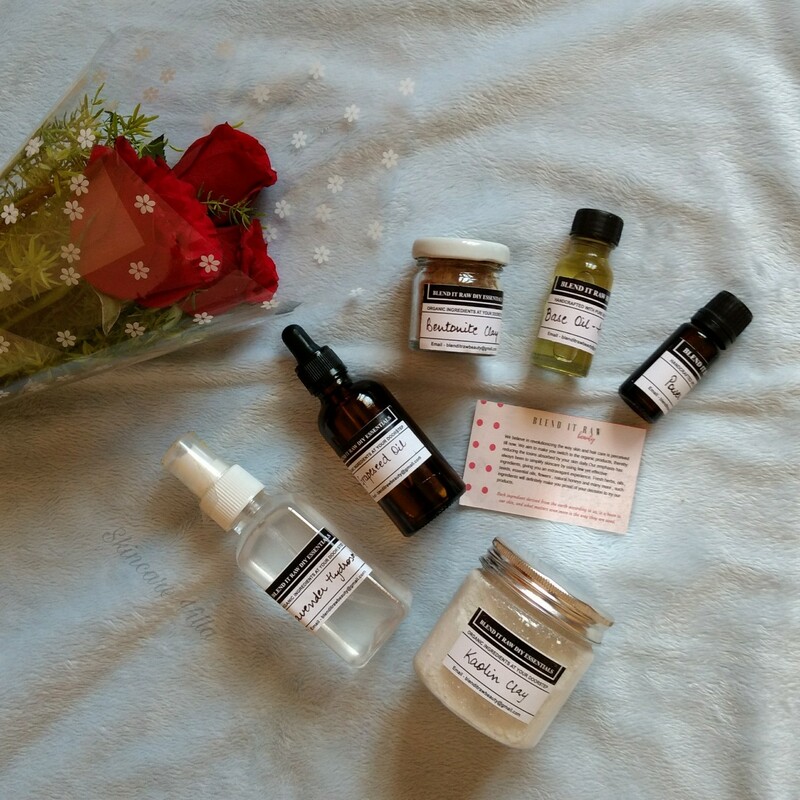 The Blend It Raw Beauty box is the brainchild of Aarushi Singhal who blogs at glitternaturally.com. The box was launched in January 2017 with the first edition being Haircare Box. So I waited as the next edition was the skincare one. Since I was travelling in February this is a delayed post 😣. Each month’s box will contain easy to blend skin, hair, bath and body recipes along with organic ingredients (5 to 6 ingredients per box) needed to make them. Most of the ingredients offered in box can also be used individually on your skin and hair, or can be blended to make a personalized products. Every month you will receive 5-6 (or more) ingredients like oils , butters , herbs , essential oils etc. at just 1,199 INR per month. Boxes are shipped on 15th of very month. You can also opt for 3 month subscription plan which has a discount of 99 INR per month. From the above list I have used Kaolin clay and Grapeseed oil and in the box they have also provided a brush, hair mask and an empty glass bottle. How thoughtful ❤️. Also read : The 5 Best Vitamin C Serum For Face: Which Is Really Better? The beauty of the box is that it let's you use the ingredients the way you want and with your favourite DIY recipe. The team has also provided a document in which they have listed some easy DIY which you can follow as a guideline. What I love the most about this box is that it doesn't contain any makeup item 😛 and is fully focused on hair care or skincare sans any brand endorsements. I would highly recommend you all to give it a try.